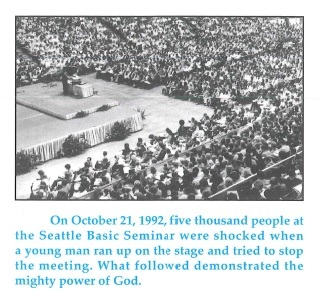 I’m sure you are all familiar with the scenario; you’re wearing blue and white, surrounded by a few, or maybe dozens, or maybe hundreds, or maybe thousands of other people just like you, and Gothard looms over you on a large screen. He’s been talking for hours; yet you’re ears are glued to him. I say ears because your eyes are not glued to the screen; they’re darting between your workbook and the ever changing words on the screen. Gothard never seems hurried, he never seems flustered, but, boy-oh-boy, those words on the overhead just fly! I’d heard Gothard many times as a child before I attended the basic. I’d even recited the first few verses of Matthew 5 to him when my family visited headquarters, and he gave me a dollar bill in reward. But I’d never been quite as enraptured, never quite so drawn in as I was at the end of a long session in the Basic. I was 13 years old. If you’ve never listened to Gothard for an extended period of time, it really can be hard to describe the experience. He’s short, and quiet, and he never yells. He tells few jokes, and he pauses from time to time, almost as though he’s struggling with the burden on his heart for the people listening to him. And the whole time he is talking, you are rushing to keep up. Every point, every illustration, every principal comes printed in your red book, with only a few words missing. As each line goes up on the screen, you hurriedly scribble those missing words down. Only when Gothard is telling a story do things slow down. But when he tells a story, you are drawn in even further. Every story follows the same basic outline; there is a dire problem, and an apparent solution. You know, you just know what the solution should be; it’s so clear. And yet, Bill tells you, that is the wrong choice. He explains the root cause of the problem (who would have thought that was the problem?! ), and shows how application of the principle he was just talking about will solve the problem (wow! He’s right!) 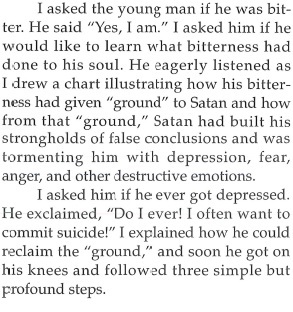 At the end of the story the main character is either completely free from the problem, or has fallen into horrible sin. And it all makes so much sense! 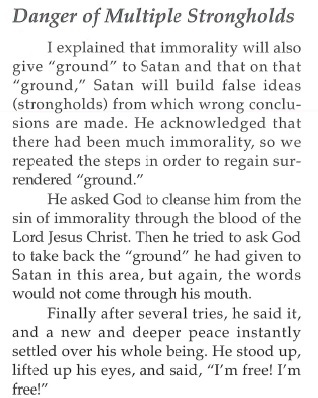 You can’t argue; Gothard has Scripture verses beside each point (well, he has references to Scripture verses, at any rate), and he explains everything so thoroughly. So when Gothard recaps his points, you find yourself nodding. Aren’t you glad he’s made it clear? Now there’s only one part left in the evening; it’s time to make a commitment. Gothard asked for a vow. A vow, made before God, that you were to hold to for your entire life. The vow I most clearly remember is a vow to read the Bible for 5 minutes every day. I was 13, and had no clue what I was doing. Predictably, I failed to keep that vow within just a few weeks of finishing the Seminar. And I felt horrible, and I tried to make it up by doing 10 minutes of Bible reading the next day. Over the years, I worried about what God might do to me because of my broken vow. About three years ago I took another vow. But before I took that vow, we spent 7 months preparing for it. We went to counseling. We talked to pastors. We asked our friends to travel to observe the vow (some of them traveled literally halfway around the world to be there.) We had long and serious discussions with our parents. There was time to think. There was time to consider what we were doing. There was counsel about how to live that vow out in a daily way. There was no pressure, no expectation of a quick decision. When I vowed to love my wife until death do us part, I understood what I was doing. I was sure of it. Fortunately, God is loving, and I don’t think he holds an emotionally manipulated 13-year-old Samuel against me. I don’t read my Bible 5 minutes every day; sometimes I don’t read it 5 minutes a week. I’m glad that my relationship with God is based on his love for me, and not on my commitment to following rules.